I am a Mum of three kids who lives in the eastern suburbs of Melbourne. I work as a self employed Accountant / Bookkeeper most days whilst my kids are at school. I discovered Instagram just three years ago when I was looking for inspiration for our renovation. I am now lucky enough to work as a content creator for some amazing brands. Content creation has become a passion of mine, my creative outlet when I’m not crunching numbers! I use both an IPhone 8 Plus and a DSLR camera. I am still learning how to use my DSLR, YouTube tutorials have been my saviour! I use a few different editing apps, my favourite is Adobe Lightroom. Can you tell us why this week’s challenge theme resonates with you? The prize this week comes from my favourite faux flower boutique, Faking Beautiful. I love using flowers as a styling aid in my home, but having to change them weekly can be costly. Faux flowers are a cost effective option. The flowers available for purchase at Faking Beautiful are so lifelike, you would swear they are real! Every week, I put together a new arrangement of flowers, tailored to my current style selection. If my feed is going to feature natural tones that week, I will stick to greens and white faux flowers. If I want to add a pop of colour to my feed - I use bright flowers mixed with greenery. A styling tip for you - use porcelain or ceramic vases to showcase your faux flowers so you can fold and hide the stems. I don’t like to cut my stems so I can use them over and over again in a range of different arrangements (in varying sizes). Can you share some of your favourite images you have created and why you love them? I was recently lucky enough to collaborate with Target to help launch their “Field of Dreams” homewares range. I love a good bargain, and of course love homewares! 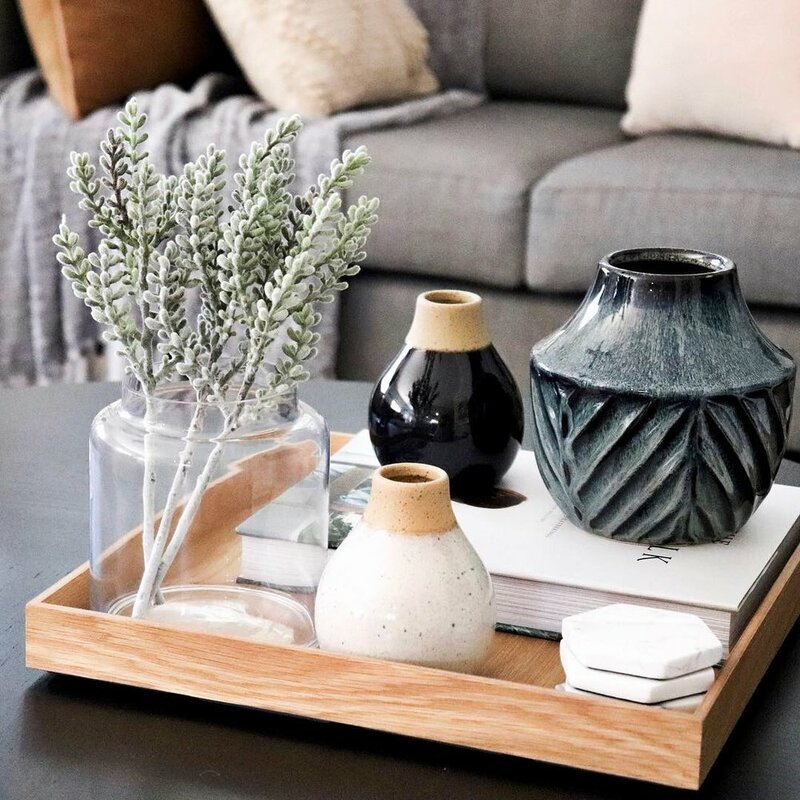 So for this campaign I was able to combine both and show my followers how I was able to style Target’s budget friendly homewares in my own home. I have prints all throughout my home. Some are expensive forever pieces, the others are inexpensive internet finds. It is these prints that I change frequently when I modify the style or theme of a room. My base colour theme for my prints is monochrome, it literally goes with everything and is super easy to photograph. I like to add a pop of colour in the form of flowers or greenery. I suffer from hay fever, which can be triggered by real flowers, so faux flowers, especially in spring are my only option. If you asked me three years ago to style homewares, I never would have been able to come up with anything even remotely close to this! This image is my reminder of how far my styling has come. I am forever grateful to all of the businesses that trust me with their products, the practical styling experience has been priceless. Any final tips on how to create the perfect faux floral arrangement for your own home? Vary your flower stem height within your bouquet to make the arrangement look more natural and not too perfect. Consider mixing your flowers with greenery. Flowers look great en masse but I prefer my arrangements to include real or faux greenery. The eucalyptus gum stems from Faking Beautiful are the perfect faux greenery option. If possible (i.e. your vase has sufficient space) bend your faux stems instead of cutting them. This will allow you to use your stems for a variety of different arrangements in the future. Don’t be afraid to bend the wires of your faux floral arrangements to shape your stems. When you work with real flowers, unless you add wire you are limited by the flowers natural shape. With faux flowers, you can bend the stem wire to position your flowers in a number of different ways. Make sure to turn your vase around to check that your floral arrangement looks great looks from all sides.